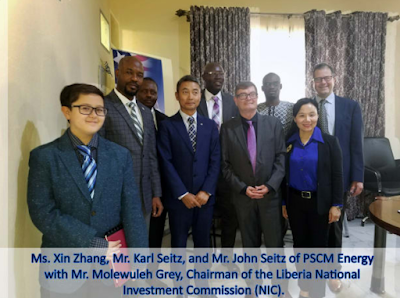 PSCM Energy, a clean energy company based in Cedar Park, Texas, is proud to announce it has signed a Memorandum Of Understanding (“MOU”) with the Liberian Government, with regards to major projects that are set to take place in Monrovia, Liberia. The MOU was signed on September 17th, 2018, in Monrovia, Liberia by the Government of the Republic of Liberia, represented by the National Investment Commission (NIC); the Monrovia City Corporation, represented by the City of Monrovia Mayor, and PSCM Energy of Cedar Park, Texas, represented by CEO, Kenneth Templeton and Ms. Xin Zhang, International Relations Director. Under the MOU’s terms, the parties agree to the construction by PSCM Energy of micro power electricity generation stations of at least 25 megawatts capacity. In addition, to construct landfill and sewage waste to energy facilities capable of producing up to 170,000 liters of ethanol per day, which will be blended with gasoline to produce cleaner burning automotive fuel. The micro power electricity generation stations to be constructed under the MOU’s provisions will produce clean, affordable and reliable electricity for Monrovia locations which are currently not connected to Liberia’s electrical grid. The projects’ intended outcome is to improve energy production in Liberia as a whole, seeing as the country suffers from critical electricity shortages which directly affect Liberian citizens’ quality of life. PSCM Energy intends to begin the construction of the landfill and sewage waste to energy and the micro power electricity generation stations in the first quarter of 2019, and will invest approximately $200 million US Dollars in the development of the projects that are defined in the recently-signed MOU between the company and the Liberian government. PSCM Energy is headquartered in Cedar Park, Texas, and provides energy ecosystem services, supply chain management, sustainable utilities and technology integration solutions for business, government and industries worldwide.